Everything revolves around the city of Los Angeles, but the surrounding cities and sub-areas offer plenty of things to do and see, as well. Play around with the neighborhoods filter here to select a Los Angeles County city and then explore that city’s or region’s activities options. For example, if you choose “Downtown LA” and “Olvera Street” you’ll be presented with information about this very important historic site near Union Station — two Los Angeles landmarks you might want to add to the list of things to see if you’re headed off to explore the downtown area. The site also provides excellent information about public transportation alternatives in the “Getting Around” section. And, speaking of good resources for looking at LA in a new way, here’s another fun resource. If you click that link, you’ll find links to audio (mp3 file) descriptions of various interesting animals that call the LA Zoo home. 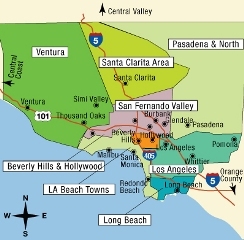 Los Angeles tourist maps are also available, of course, at the Buena Park and Oxnard tourist information centers run by the state, as well as at outposts for conventions and visitors bureaus in various Los Angeles area’s cities. “Maps To the Homes Of The Stars” is perhaps the most popular genre of tourist maps for Beverly Hills and Hollywood, and they are often sold in shops that cater to tourists. Frankly, though, we can’t recommend you spend your money or time on them. (The same advice applies to most guided tours of this ilk.) If there’s a particular star you are interested in, this celebrity address lookup page may be of interest to you.